These inexpensive hollow point cartridges work well for both target shooting and hunting in rifles like the SKS and AK. 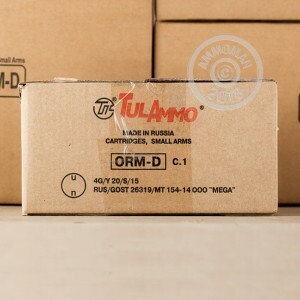 Manufactured by Tula, these rounds come in cases of 1,000 and fire a 124 grain bullet at a muzzle velocity of 2,330 feet per second. 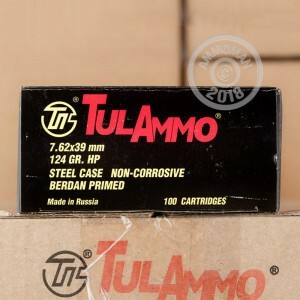 Tula ammunition uses non-corrosive Berdan primers (unlike some military surplus) and non-reloadable steel cases with reliability-enhancing polymer coatings. Polymer coatings are an improvement over previous generation lacquer coatings, which typically produce more residue and increase the amount of cleaning needed after a shooting session. 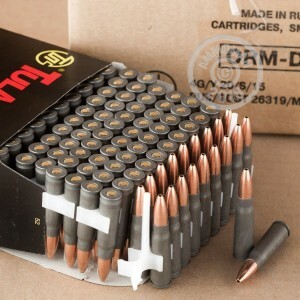 Grab a few of these 100 round boxes or any other items totaling $99 or more at AmmoMan.com to qualify for free shipping!